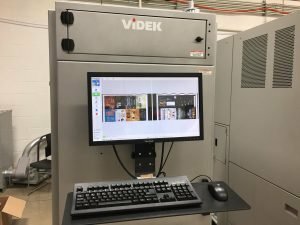 Heeter became the first commercial printer in the United States to buy and install the Ricoh VC60000 inkjet web press in 2015. In 2016 this new press increased the number of digital pages printed at Heeter by 202%! That dramatic increase in production bandwidth prompted Heeter to invest in the Videk Camera System. 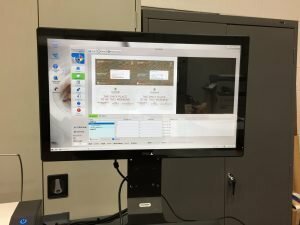 This technology complements the new workflow while adding additional layers of quality and accuracy controls. Heeter is the first printer to utilize this camera system on the VC60000. The Videk Camera System is installed “inline” on the Ricoh VC60000. So it is part of the printing process when the press is running. Once a product has been printed, a two-camera system reads every pixel of both sides of the sheet. It then stores those images. Those pictures can then be used for accuracy control steps via live viewing, freeze frame and data comparisons (a step where we compare the image to what is stored in the original database). They can also be used for quality control processes to monitor color consistency, image quality, and registration. Plus this enhanced QC process allows us to run the inkjet web jobs faster! For our customers this results in a better, more consistent color product. Clients also have the option to review live data proofs, monitor quality control pieces (QCPs) throughout the print run and retain images for customer service or compliance use. Heeter also took the benefits of this technology and extended it to our Cut Sheet Digital Print Workflow. This “near line” process mirrors all of the benefits detailed above but follows a slightly different production process. We are now able to extend our current cut sheet quality control press pull process (basically pulling sheets at designated intervals -i.e. every 100th sheet) and feed that sheet into the camera system to capture the print and data on the sheet. So now customers can have the same higher level QC checks on digital products regardless of what machine produces the work. This custom developed project makes our solution unique in the marketplace. Higher levels of quality and accuracy mean our clients can develop sophisticated, full color personalized products that drive higher response rates. Marketers gain the cost and speed benefits of our inkjet web press and other digital presses, with the confidence that the quality of the print and the accuracy of data are very high. To learn more about the Videk system and other Heeter innovations, contact your Account Executive.